The Avengers (including Ms. Marvel, She-Hulk and Scarlet Witch) get ensnared in Kulan Gath's 'snake like' things. 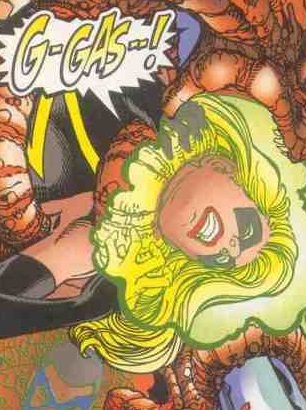 The snakes release knockout gas, rendering The Avengers unconscious. In the 4th panel the girls are lying unconscious in nice poses but the scene is too microscopic.